Not sure if this is truly a spoiler or not, but I just remembered something. In 0.2, Ven's jacket colors were switched around. My first instinct is that it reminds me of Roxas and his checkered Pattern in his outfit. But yeah chances are it probably was just an error, though a bit or a strange one. Both Roxas and Ven have this checkered Pattern in their clothes, maybe the person responsible for the outfit got confused? This is strange... and with Nomura, you never know what random detail could be important. What does Ven even really do in this scene... maybe it's a callback to his Union Cross days or something? With 0.2 being the game to explain a reason for why Mickey's clothing circa KH1 was only a pair of pants and yellow shoes, I lean towards the assumption that Nomura will have a reason for Ven's clothing being off from usual as well. 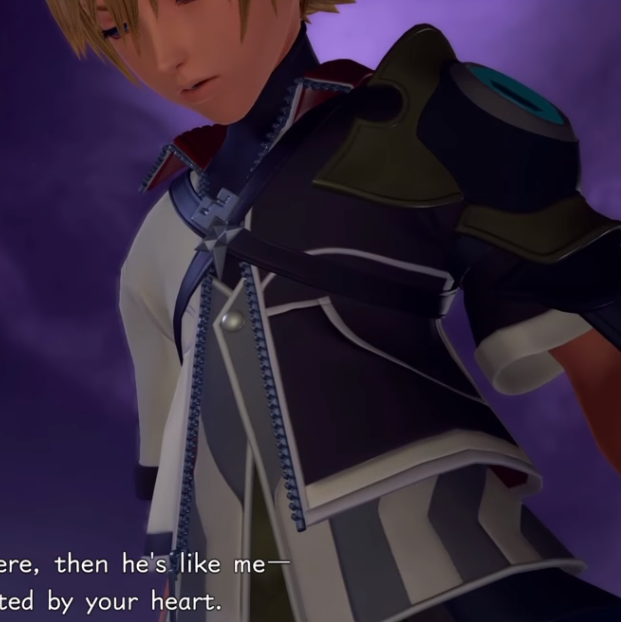 Hard to believe they could accidentally misinterpret Ven's clothing in such a noticeable way and let it slip til the end, but even if it was a simple mistake, Nomura will likely make a reason. My first thought is that the checkered pattern would be reminiscent of the chess theme KH3 has going on, and with apparently a "new game" being played with the chessboard involving KHUX characters at the end, perhaps it has to do with Ventus being important to the chess game. I just went and checked around. As far as I can see, none of the previous iterations of Ven have this checkered pattern. Not him before Vanitas leaves him in BBS, not him in the opening of 0.2, not his model in KH3, not Xion when she turns into Ven in Days, nowhere. The only place I haven't checked... because I can't, is in Union Cross. Potentially his outfit could be different there. I guess. Which is somewhat strange as he's 10/11 during Union Cross and smaller in stature and build. When he's 16 in BBS itself and obviously grown up somewhat these clothes should no longer fit him except if Eraqus is capable of magic to enlarge clothes in size, lol. I think the only difference in the clothes in the 0.2 cutscenes are on his back, I mean. The strange checkered pattern is on his back and only in the 0.2 cutscenes. Ven's model from Union Cross (or sprite?) doesn't have a back view so we can't compare it to the other image. Oh! You're right, the checkered pattern is only on his back! A very strange choice.